Saluting a tangy classic on National Shrimp Day. The Golden Gate Hotel & Casino has been serving up shrimp cocktails -- lots and lots of 'em -- since 1959. THE TANGIEST TRADITION: When asked to name some potent, memorable, and long-running Las Vegas classics, answers may vary, delightfully. Some might say neon lights, though LED has taken the lead in the illumination race in recent years. Some might say over-the-top shows, the kind with feathery headdresses and sequins and aerialists swinging from the flying trapeze, and they'd be 100% correct. No argument there: Sin City brims with shiny splash. And those looking to the food end of things might cite pricey steaks, stiff gin & tonics, and shrimp cocktails at a steal. SHRIMPTASTIC SUPERSTAR: Of course, that last category belongs, in Las Vegas legend, to one spot and one spot alone: The Golden Gate Hotel & Casino. The historic lodge at the corner of Fremont and Main Streets has been synonymous -- if "synonymous" is strong enough a word -- with the discounted appetizer since 1959 when Italo Ghelfi, a founder of the Golden Gate, "introduced the popular San Francisco recipe to the casino scene." Some long-timers might remember when the cocktail went for under a buck, then just under two, but the treat, which contains about 30 or so medium-sized shrimp, now goes for a penny under four dollars, still quite the bite-ready bargain. Will more fans show up on May 10, which happens to be National Shrimp Day, for that $3.99, cocktail sauce-laden, shellfishian favorite? Well, it also happens to be Mother's Day, so if you're doing downtown with Mom, you might want to swing through the Golden Gate and make for Du-Par's Restaurant & Bakery, where the shrimp cocktail is now served. THE SUPPING OR THE SUNDAE GLASS? 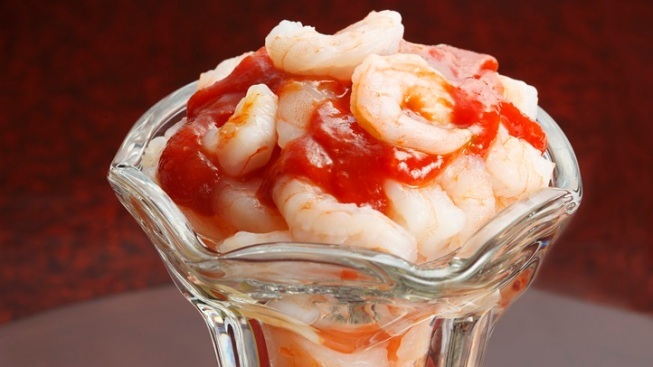 Fans of the famous Vegas appetizer have to answer this, however: Is the shrimp cocktail more famous, its low, low price, or the iconic sundae glass it is served, and always has been served in, along with some crackers and lemon? We think it all works, the glass, the deal, and the meal. Can't have one without the other, but you do have to make for the historic heart of Sin City to dig in.